Although Avlichos was primarily a portrait painter, the painting by him in the A. G. Leventis Foundation Collection is a genre scene. 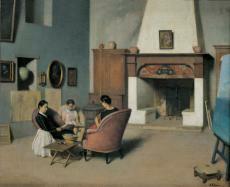 The artist has depicted his family gathered in his studio. They are surrounded by paintings and drawings, and the work on which Avlichos was then working can be seen on the easel. Each family member is absorbed in his or her own preoccupation, reading a book or doing needlework. This is a casual, ordinary scene that the artist has drawn from his own life. Yet, he managed to transcend expressively the element of the prosaic or familiar, everyday reality and the confines of the specific moment in time, making this one of the artist’s supreme visual creations – as well as one of the most fascinating works in 19th-century Greek painting. Having opted for an extraordinarily discreet, cool colour palette here, Avlichos succeeded in achieving a low-key, almost poetic effect. He created an atmospheric distance between the viewer and the canvas, which isolates his subject, imparting it with autonomy. The painter, poet, litterateur and musician Georgios Avlichos, was born in Cephalonia in 1842. His love for painting led him to Naples, where he initially took painting lessons. He then studied law and later travelled to Germany to pursue his art studies. When he returned to Cephalonia, he worked as a bookkeeper and taught painting. Avlichos was greatly influenced by Italian academic art and he is considered an exponent of the art of the Ionian Islands of the 19th century. His paintings are mainly portraits and genre scenes. Avlichos does not fit into any school, but, as art historians have suggested, his work brings to mind later painters such as Balthus. The Artist’s Family in his Studio, painted around 1875, is one of the most extraordinary and masterful paintings of the A.G. Leventis Collection. The painting portrays his serene studio with his own work and easel. Opting for a cool palette he discreetly describes the members of his family; each figure devoted to some casual occupation, is ‘harmonised’ with the poetry of the atmosphere. The painting itself is faint, slightly blurry, recalling an out-of-focus photograph; its style imbues the painting with a tuneless, almost metaphysical quality.